Wissy's blogspot: Polperro and Looe in Cornwall. 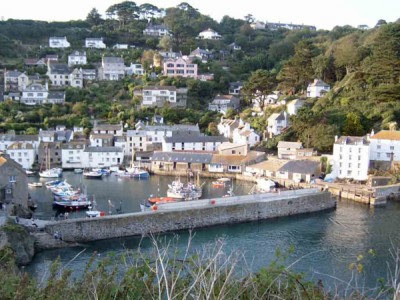 Polperro from the coastal pathway. As stated in my previous post we have just returned from a short stay in Cornwall to celebrate our 30th wedding anniversary. I had only been to Cornwall once before many years ago and then only explored the north of the county and mainly from the inside of a car as the weather was so lousy. 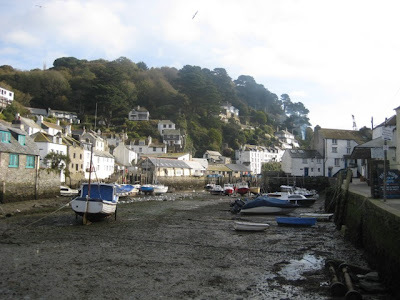 This time we wanted to go to the south coast so we booked a small bed and breakfast hotel midway between the two fishing ports of Polperro and Looe. 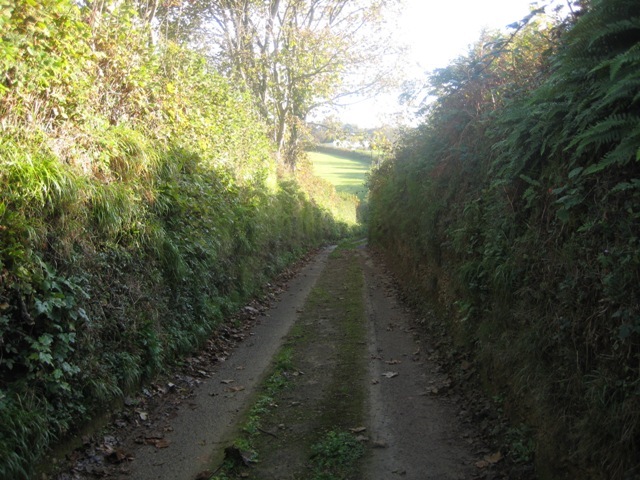 The narrow lanes with high hedgerows. We had to lie flat against them to let passing vehicles pass. We chose well. The hotel was beautifully placed within a couple of miles of the south west coastal path so we had the opportunity of some walks direct from the hotel without driving anywhere. The South West Coast Path is a national trail with some 630 miles of superb coastal walking. From Minehead on the edge of the Exmoor National Park to the shores of Poole Harbour in Dorset it is the best way to enjoy the wonderful coastal scenery, wildlife and heritage of the south west of England. We were determined to sample and walk a small part of this great trail, so on the first morning of our stay, fueled by a hearty cooked english breakfast we set off to walk the coastal route to Polperro and then continue along the coast to Looe and then back to our hotel. A distance of about 10 miles. We started off walking along very narrow tracks with high hedgerows. If a vehicle appeared, which happened infrequently, we would have to press ourselves firmly into the hedges to enable it to pass. These hedgerows were amazing and would have been very pretty in the spring/summer as they were full of flowers and plants. Once we cleared these tracks we were by open fields with a view of the sea in the distance. Traversing the fields we followed the walkers signposts and suddenly found ourselves walking along a small lane lined by coloured fishermen cottages high on the cliff leading down into Polperro. 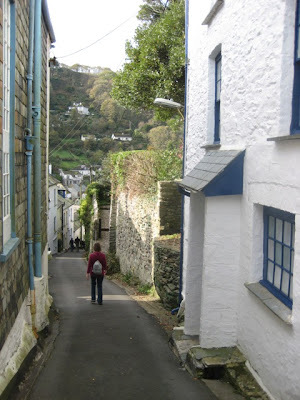 Walking down the steep hill into Polperro. One of the most prettiest villages in Cornwall, Polperro is set in a cliff ravine with a an enchanting jumble of cottages, each one unmistakably the work of a Cornish fisherman. This peaceful fishing cove was once a thriving centre for the area's smuggling. 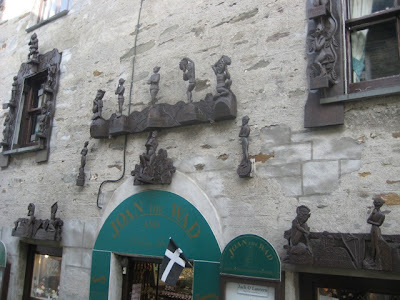 The narrow streets are traffic free and there is a lovely sheltered harbour and quay. Although quite commercial with a thriving tourist trade, we were very taken with the beauty and history of this quaint fishing village. We were lucky enough to take a small fishing boat out of the harbour to see Polperro and the beautiful neighbouring bays from the vantage of the sea. Waiting for the tide to come in by Polperro harbour. ﻿On our return we explored the village, browsed the gift shops and had a relaxed and refreshing coffee before retracing our steps and walking up the incredibly ﻿steep hill to re-join the coastal path and head towards Looe via Talland Bay. I will relay details of the rest of our hike in my next post. 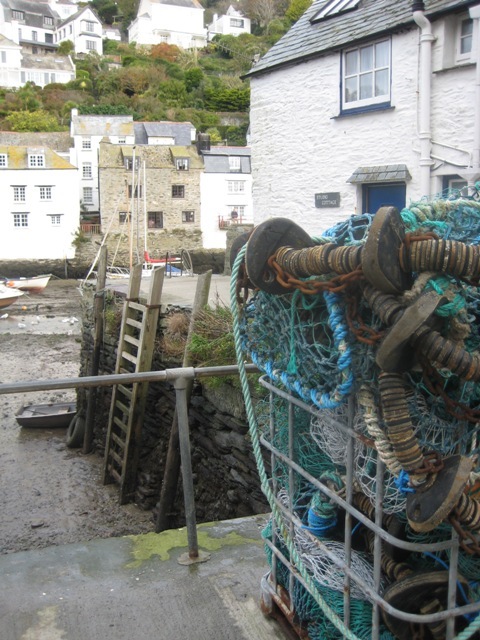 Fishermen's nets by the quay. Interesting carvings above a shop in Polperro. Note the Cornish black and white flag. I am glad your enjoyed Looe and Cornwall!